I'm on my way from Royal Oak, and every air-exposed surface is covered with a thin sheet of ice. Then, as if to hide itself, Mother Nature's decided to top off that ice with a light dusting of snow that just helps to disguise the injurious potential of the slickness below. Yup, the storm, travelling at roughly 45 mph, has already passed here so things look craptastically icy out there. Perfect — let's roll. I just glimpsed my first (of what will more than likely be many) accident of the day at 696 just before the Woodward Avenue off-ramp. Two SUV's of an indeterminate make, model and year. Lucky for any potentially injured occupants, although the police do not appear to have arrived yet, Fox 2 news is on the scene cameras in hand. I'm sure they're there to give them comfort until real help arrives. And now I'm passing my second accident. It's a later-model Suburban and a VW Golf. Looks like the Suburban took the brunt of the impact via the wall. Unlike the previous incident, the overworked State Police are on the scene. I slow down as I watch their cherry-top lights spinning, their bright red glare dancing across the icy highway as I trudge by. As I begin to speed back up, I feel the front wheels spin a bit, and then almost simultaneously, I feel and hear the ca-chigga-chigga-chigga of the AWD kick in for the first time. 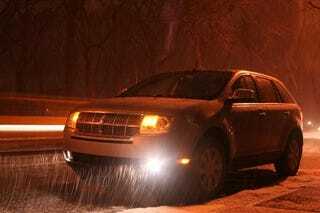 I feel the rear tires burst into a mini-sprint, kicking the MKX forward, and moving me along my way. I'm now crossing over into Ohio, leaving behind Michigan's highway speed corridors for the modicum of "safety" provided by helicopter-enforced 65 mph speed limits. Yay. Looking on the bright side, I'm finally going to be able to see what the fuel economy's really like in something other than Michigan's Formula-One-like interstate system. Stopped at a turnpike off-ramp in a location the nav system calls "Unknown, Ohio." I won't dispute that. Although the Lincoln doesn't yet need any fuel, I do need some as I skipped breakfast in my rush out the door. I know I probably won't be stopping often, so I fill up with an Einstein bagel and a Starbucks coffee. Mmm, turkey sausage, cheddar and omelet on a potato bagel. Delicious. Just made it into Pennsylvania without any real incidents, but I know the "Pennsylvania Wilds" are where I'll probably hit the worst of the storm. Now that we've got about 150 miles on the vehicle at "normal highway driving speeds," I can say unequivocally I'm going to hate going back to my gas-guzzler of an SUV just because of what it's going to do to my wallet. I'm getting 21.9 MPG. While not amazing, given the base Lincoln MKX AWD weighs in at a hefty 4420 lbs (and this pimped-out version's nav system and the power rear seats alone add 172 lbs more onto that number) it's not bad. I'd actually love to see what the more-svelte Lexus RX 350 or BMW X3 would garner — although with both of those luxe CUV's, it's suggested I should fill up with premium, so there's added costs associated with that. Stopping for gas in the Pennsylvania Wilds in the sleepy little township of Monroe, I've seen my fuel economy drop in the rolling hills to 19.6 mpg. But that's forgotten when I enter the restroom at the local McDonald's while I wait for the 20-gallon tank to fill up with the regular stuff. I'm greeted by Christian rock playing over the intercom at the urinal. Yup, although the 3.5-liter V6 has become a bit less efficient out here in the "Wilds," at least I know Jesus loves me. Felling "saved," I'm back on I-80 heading again toward New York. I know I'm getting ready to hit the storm front even before I flip on the weather channel on Sirius, just because of the dark and gloomy clouds I'm seeing in front of me. Excellent. With The Who's "Baba O'Riley" playing on channel 29, I'm approaching 80 mph to catch up with the storm in the hills. I feel comfortable at this speed because I know all about Pennsylvania's recent round of budget cuts eschewing increases in State Police funding in favor of yellow signs that say things like "Buckle Up, It's The Law" and "Slow Down, Save A Life." They should have just put up a sign that says "Pennsylvania: Where We Need Yellow Signs To State The Obvious." Temperature's dropped to 28 degrees, so the rain that's been falling here in PA is turning into a thin sheet of glass-like ice or "clear ice" as I've been known to call it...mostly because I believe "black ice" is such a misnomer when you're on concrete pavement. Whatever you want to call it, it's twice caused the front end to slip a bit as I hit the accelerator. But, each time I feel the front end start to lose control, just as quickly, I feel the rear end firmly kick me in the right direction. Oh, and I've lost track of the number of accidents I've passed. This is really fun stuff to be driving in. Why am I doing this again?